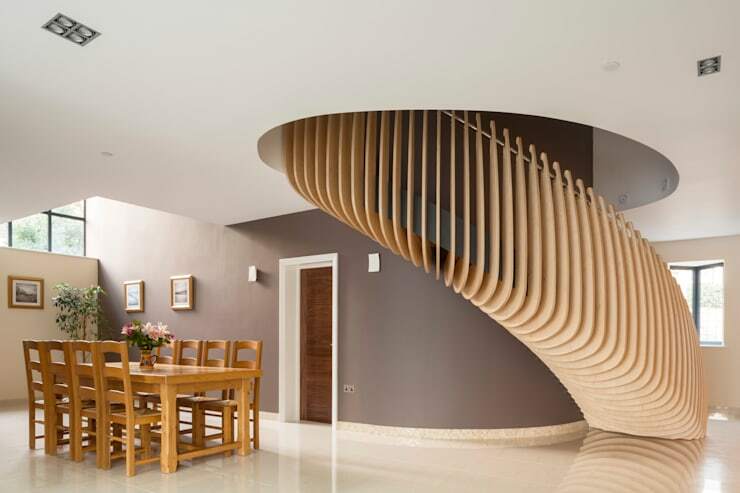 Circular staircases, also known as helical staircases or spiral staircases, are a practical solution when we do not have the space to build a conventional staircase. For a conventional staircase, you need perfect dimensions, which is not always possible in smaller homes. That's OK though, because it gives us a chance to explore some really interesting ways to build staircases! 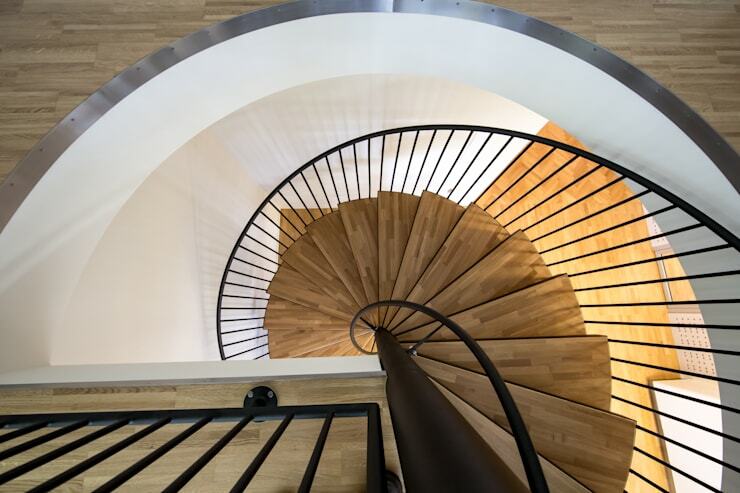 We can even have a traditional and typical spiral staircase that rotates around a vertical axis, transitioning from smaller steps at the top to wider and larger steps at the bottom. How cool is that? The definition of a helical motion is clear: a rotating movement around an axis. This is what determines the shape and structure of a spiral staircase. This type of motion can allow us to access one floor from another, without having to use a straight ladder to climb up and down, but just as convenient! In this book of ideas, we will show you six examples of circular staircases and show you how they are both comfortable and safe. Take notes! 1. How much space do you need for a circular staircase? When it comes to designing a circular staircase, we need to first figure out the height of the space that we are working with. This is the space between the first floor and the second floor. It's important to know this as we need to know where the stairs will start and where they will end. The steps of the stairs will each have what we call a footprint, which is defined by the size of each step and the height, distance and space between each step. We must first take into account the size of each step, where our foot should fit comfortably when going up or down the stairs. Because of the nature of the staircase, each step will probably transition from a narrow to a wide shape, kind of like a leaf-shape or a triangle. The narrowest point is where the axis or centre of the staircase is, while the widest point will be where the railing is. It is recommended that the middle of each step should not be less than 25cm, while the widest part should be about 60cm. You don't want the stairs to be so narrow that you fall down them because your feet don't fit! In terms of the distance and height between each staircase, you want people to be able to climb the stairs comfortably. Take the space between the two floors and divide it up by the number of stairs you'll need. There shouldn't be more than 17.5cm between each step. You also don't want the lower steps, which will become wider, to be more than 80cm wide. Space for the railing also needs to be taken into account. With these measurements, you should be able to study your space and work out how the circular staircase will fit into it. 2. 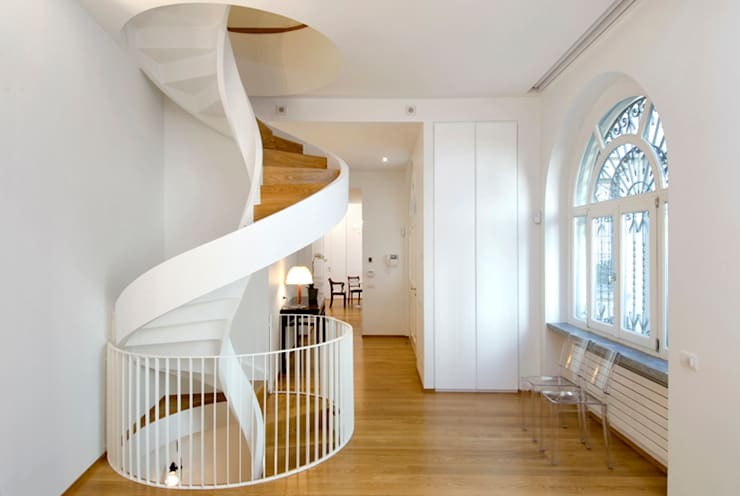 Why choose a circular staircase? When embarking on a staircase project, you need to take into account the space available. If you're looking for a conventional staircase, you need more than 2.45 metres between the upper floor and the lower floor. If we divide this space (2.45 metres) by the 17.5cm for each step, we need around 14 steps with each step being around 30cm long. There also needs to be space for a rail. If you work out these dimensions and measurements, you need around 3 metres by 2.7 metres in terms of space for the conventional staircase. In many homes, this is just too much floor space! A circular staircase, however, goes straight down like a ladder, which means that you use up far less horizontal and vertical space. 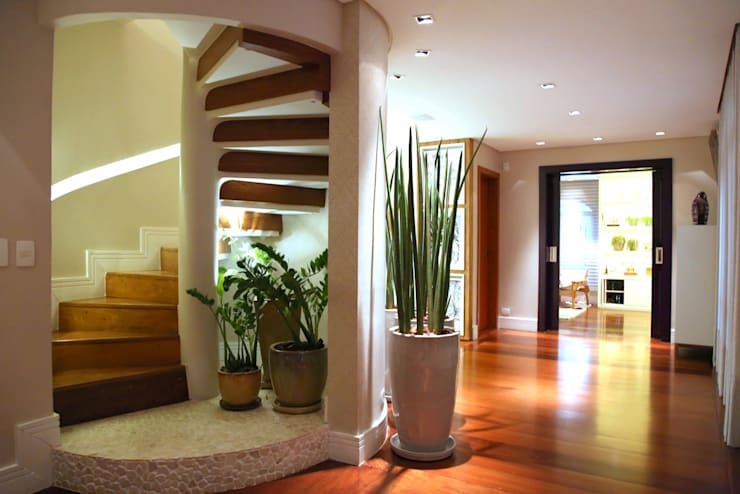 There are many reasons for opting for a circular staircase, especially when it comes to space constraints, but there is also a reason why this is a very modern style that many are opting for. If you look at this beautiful design, by Padi Construction, you will notice that the design looks more like a sculpture flooding a vertical space in a circular way, which has the simple function of a ladder. Interior decor takes into account the design of stairs, using materials made from glass, wood, raw concrete and steel, either painted or left rustic, to create a wonderful overall effect in a home. This design is unique and stands out as an art form where ever it is placed. When you have an upper mezzanine level or a smaller gallery or balcony, with more space on the ground floor, it is much better to use a circular staircase. A circular staircase allows us to access the upper floor without taking up too much space in our dining room or living room. This means that there is a connection between the upper floor and the lower floor, without disrupting the harmony between the rooms on the ground floor. These stairs can be light, made from metal and painted to blend in with the decor throughout the rest of the interior. Steel or glass steps can also be used, depending on the budget as well what works with the rest of your decor. Circular or spiral staircases can even be sold to an owner as a collapsible set, where with simple instructions and the right safety precautions, they can be secure and beautiful features in the home. The designs of these types of stairs depend on the space that they will occupy. The materials used, the style of the stairs, the space between the stairs, whether they are made from steel or glass, if they are floating stairs and if the railing is made from concrete or wood, is all designed in a workshop before the finished product is assembled on site. There are different types of circular stairs for every taste, creating a way to get from the top floor to the bottom floor without taking up too much space. Don't you love this design by Architektin Di Ulrike Wallnofer? 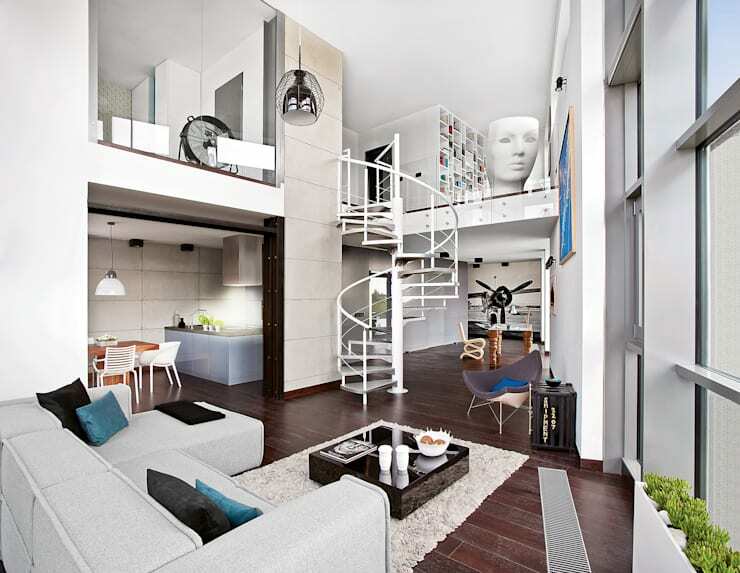 Just when we thought that we knew everything that there is to know about circular staircases, this design appears! It's part of the design of a wine cellar, where all of the wine lives! 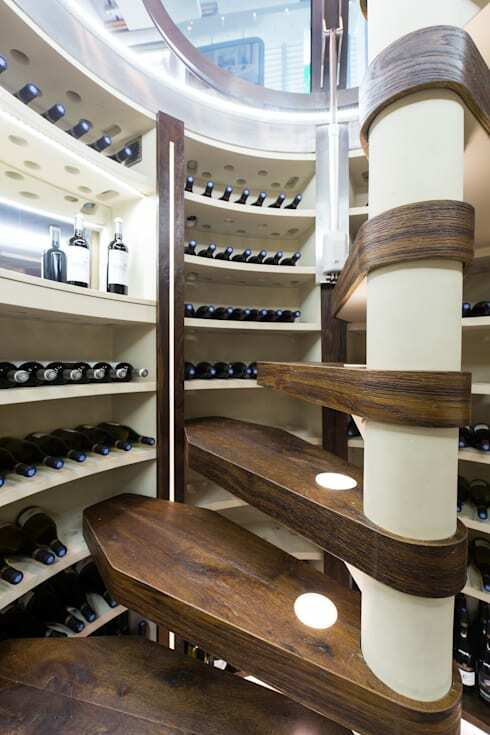 The happy owners of champagne can use this staircase to access all of their favourite wine. This is a very successful design for a small space, keeping this precious liquid safe. Each shelf also makes up the staircase, allowing for very little space to be taken up by the circular staircase. This is our favourite! If you have a small house, you'll find something useful in these: 8 Ideas To Maximise Space In A Small House. Are you a fan of spiral staircases? Would you ever consider building one in your home? Let us know in the comments!